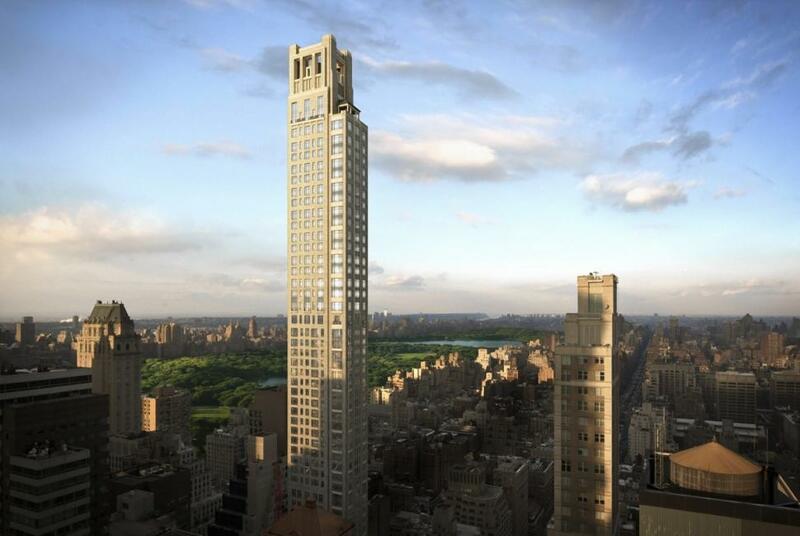 Rendering of 520 Park Ave, whose penthouse is listed at $130M. In September of this year, the New York State Assembly proposed a so-called “pied-a-terre tax,” which seeks to impose a tax on the City’s super-rich, non-resident homeowners for units worth more than $5 million. A lightning rod issue if ever there was one, the proposed tax has drawn fiercely heated debate from its supporters and detractors alike. Critics say that the tax is unfair, that these homeowners already pay an overwhelming percentage of the city’s taxes, while receiving little to none of their benefit. Its supporters claim that non-resident owners don’t pay City income tax and, as such, aren’t paying their fair share. If a straight, black-and-white interpretation of the bill, as it is written, were taken, you might believe that this tax would apply only to super-rich out-of-towners, who sweep into New York City, stay for a day or two in a vanity apartment here, then leave (this is the classic definition of “pied-a-terre”). Look more closely, however, and the proposed tax could go far further. A careful reading of the City’s definition for a “non-primary residence” points to many cases outside of the classic “pied-a-terre” scenario that would be affected by this bill. Of the apartments that would be subject to the “pied-a-terre tax,” how many are actually pieds-a-terre? 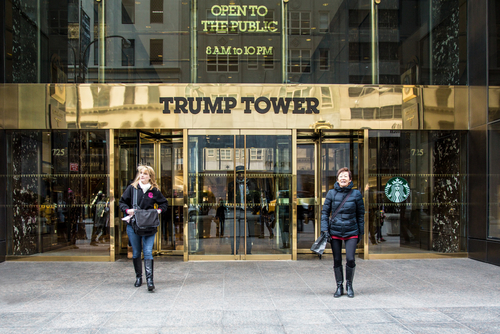 One building, Trump Tower, has been cited again and again in relation to this bill. 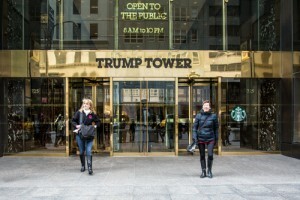 According to both the New York Times and the Wall Street Journal, only about 50% of Trump Tower apartment owners are residents, by the NYC definition. We calculated this number ourselves and reached a far lower figure. Out of 237 units, only 30 are on track to be counted as owner-occupied units in 2015 (a number we verified with the NYC Independent Budget Office). Does that mean the other 207 units actually second homes that are vacant most of the year? An analysis of City tax records reveals that 124 of these units are owned not by individuals, but by LLCs or partnerships. 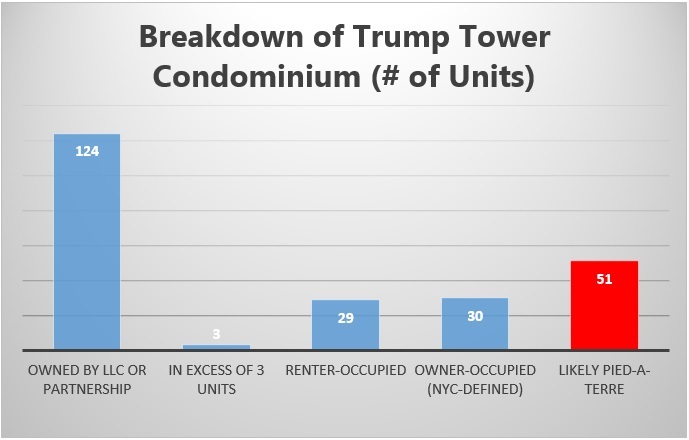 Some of these units likely are second homes, but a deeper look into a sample of cases shows most of them to be either commercial offices or the primary residences of high-profile individuals, more than likely looking for privacy. Looking closer still, an additional 29 units are likely to be renter-occupied, having recently been listed for rent on Streeteasy. Another 6 are owned by a single owner, causing 3 of them to be treated as non-owner occupied. Of the 207 units that fall under the City’s definition, it appears only 51 (or just 25%) are likely pieds-a-terre. In the same article, the New York Times also points to a three-block stretch of midtown where, according to the U.S. Census, almost 50% of units are vacant. We arrive at the same figure. 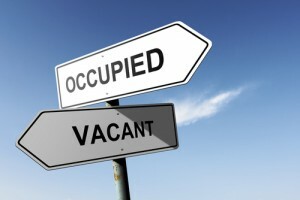 However, being vacant does not always mean that an apartment is a second home. According to the methodology explained here, only 25% of reported vacancies in New York City are due to “occasional, seasonal, or recreational use.” More commonly, a unit is vacant because it is up for sale, for rent, or under renovation. According to media reports, given that the bill has little support in Albany, Mayor De Blasio is unlikely to sign it, though liberal lawmakers are hopeful that the measure will gain traction. While we’re not debating here whether the tax, itself, is right or wrong, what we are saying is that the crux of the debate is incorrect. As the proposed “pied-a-terre bill” is written, most of the units that would be subject are not actually even pieds-a-terre. Want to know how a building’s property tax rate stacks up? Search for any Manhattan address. Schedule an appointment with our data experts.